And because they'll be singing loud enough to drown out the sound of the grass growing — which I am convinced is louder than the sound of the mower that can't keep up with how fast the grass grows. Lambs, too, on a neighbor's nice farm. Seed catalogs started arriving today. Which means that some of my favorite reading of the year begins today as well. 2013 begins, with all the promise and all the challenge that each new year brings. I'm looking forward, as always, to learning — and re-learning — some of the old lessons that this land has tried so hard to teach me. I am doing so in hopes of really learning the lessons this time. In so far as anyone ever does. That, it seems to me, is one of the great gifts of a piece of land and all that comes with it. The chance to learn and to go on learning, the same lessons year after year, and discovering that the lessons, however often learned, and the learning itself, never grow old. I love this little farm more than I can say. It has taught me so much, and continues to. What Part Of This Sign Don't People Understand? Clearly not the request — NO BRUSH ALLOWED — which is actually an instruction, but just as clearly the depositors are beyond instruction. 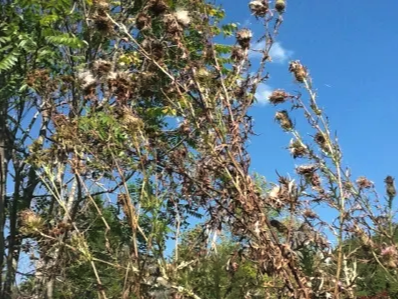 I had thought that last week's cold snap — no frost yet, and nights not quite down into the 30s, but still — would have signaled the end of thistle meals and bees partaking of them. Evidently not, as witness my discovery this warm and sunny Sunday afternoon. And is the mighty Ranger going to succumb to the local vegetation? Ny thinking, actually, is that the mighty Ranger may well become a butterfly retirement home. 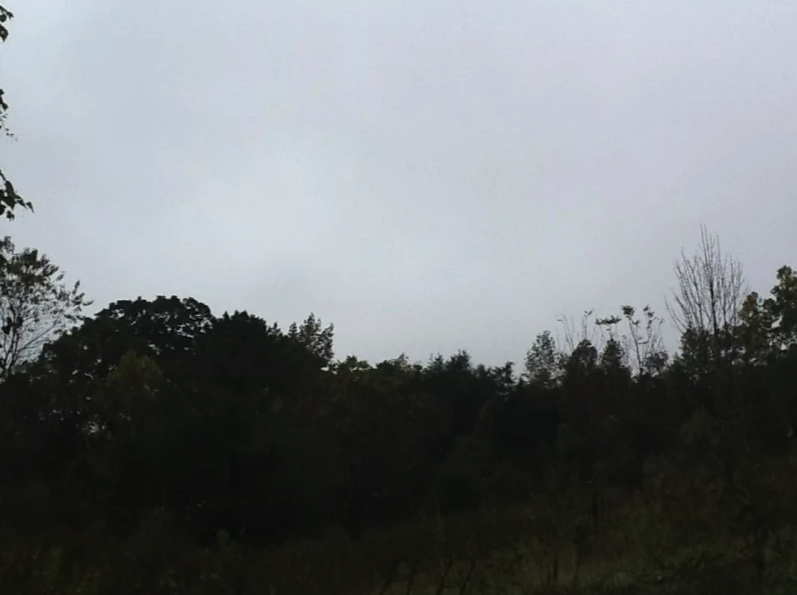 The first chill drizzle of the fall, and not unexpected. Nor unwelcome. An opportunity for long gazes through water-beaded windows, the world beyond the panes slipping away from the shores summer and their promises and pleasures, and on into the landscape of fall with its different, more contemplative, perspectives. The butterfly and bee buffet is closing for the season. But even as it shuts down, preparation for another buffet is well under way. The winds bringing in a cold front should help scatter the down. Ensuring another feast, about this time — thistle time — next year. The odds that the land will be bought by a farmer rather than a developer may not be large, but we can hope. Maybe the difference will be split, and an investor will buy it and lease out the farming rights. That's essentially what's been done with the land for the last decade and more. I've always enjoyed passing these fields as I come in to my place, and have always used the various stages of work, from planting in the spring tithe stubble of winter as one of my indices of time passing here. But that's changeless time, season after season of crops, work, rest, and changelessness is an illusion at best. 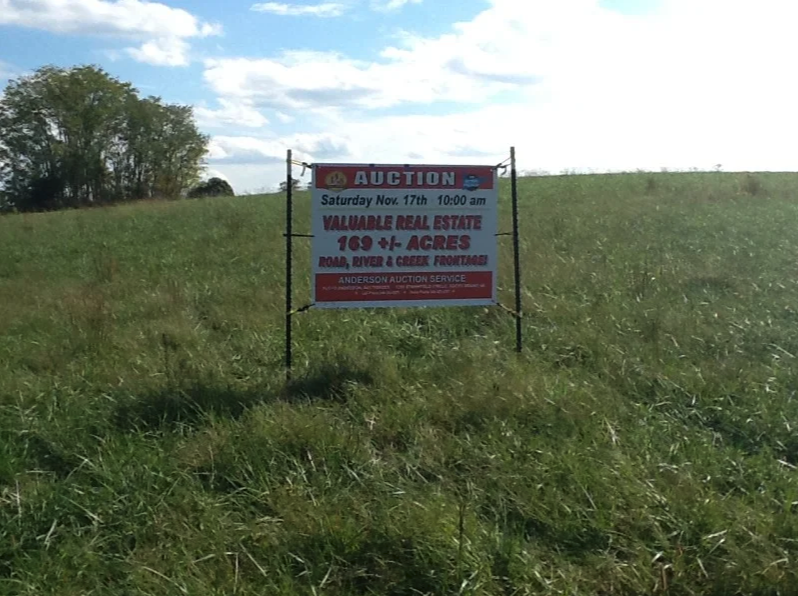 The auction is about six weeks from now. Not much time to savor something I thought changeless. But when is there ever? Who's Afraid of Thomas Wolfe? October clearly on my mind — and this farm blog — I found myself writing of that great October (and all the other months, too), Thomas Wolfe on my other, more wide-ranging (or just less focused blog, Cultivating Keith. If you take a look, let me know what you think. Do any of you read Thomas Wolfe? Of all of our great novelists, he and Faulkner had the most finely developed senses of nature. Both of course have much to say to us today, about nature, and our place in it. Before long we'll be having the other kind of October day and October sky — brilliant blue and bracing. But yesterday and today have been unbroken gray, drizzly and misty. Late in the day the gray began to lessen, letting us know that "before long" means tomorrow, probably. Gray, rainy, a hint of mist lingering against the rain's efforts to wash it away. The kind of morning when at least a little time will be spent planning what needs to get done when the skies clear and the ground dries out. The month off to a good start, redolent of and resonant with its transitional nature. Rain on and off all day yesterday, fog early this morning washed away near dawn by heavier rain. Cool but not yet chilly. Fall continues approaching this little farm by way of hints, suggestions, subtleties, not yet any large portents but they are out here and they will come. Fall by the calendar for a full week now, but not yet by this farm. Most of the leaves remain on the trees, and most of them remain green. But there are hints by the sides of the road, and before long there will be portents, and not long after that the trees and the weather and the rest of it will know that it is autumn, and none involved will be able to deny it. So much still to do in preparation but in other ways I am ready, and have been. In her fine biography, John Fowles : A Life in Two Worlds, Eileen Warburton writes of the great novelist and naturalist's frequent walks, during which he often "plunged into the woods, cutting his way off the path, secateurs in hand. He led friends out along the cliffs, and left them bewildered, as as he charged off to examine some new discovery, moving quickly out of sight." Fowles's approach to the territory he explored with his typewriter was much the same as the terrain he entered with his secateurs — off the known paths, in search of discoveries. The right tool, as it were, for the particular job. And the right name — le nom juste! — for the right tool. 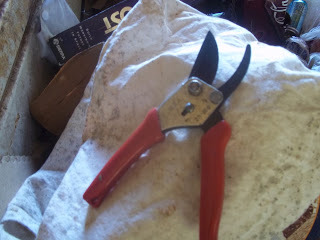 When I slide the latch open and use mine near the house they are pruning shears, and reliable ones that have served me well for years. They take and hold an edge well, and other than sharpening have required very little in the way of maintenance.Good pruning shears. But when I leave the vicinity of the house and yard, the same tool magically becomes my secateurs, a lovely word for a lovely tool. With "secateurs in hand" I can press deep into the woods, and do so in at least occasional, if unworthy, company with the great naturalists of the past. I carry my secatuers with me almost everywhere and have used them on everything from vines and branches to rusted strands of ancient barbed wire discovered deep in the woods, far removed in space and time from any clearing that would need to be fenced.. I have many tools that I love, but this may be the tool I love the very best. I wonder, now that John Fowles's personal library is being sold, what became of his no doubt equally cherished secateurs. I hope that they found a good and appreciative — and an owner who carries them, and a bit of John Fowles with them, at least occasionally off the easy path. I had been wondering until just a few days ago whether or not the late eggplants I had started were going to flower and fruit at all. Now, following the first really cool, though frostless here, night of the season, I'm wondering just how long the frost will hold off -- and how long these little guys will hold on. I knew it was late, and probably way late, when I started them after the deer took the first planting. But foolishly or at least giddily I did so anyway, knowing full well how much eggplant dislike chilly weather, much less frost, but curious as to how close I could cut it and still get fruit of enough size to use in the kitchen. Too close is clearly looking like the answer to that question, though I haven't completely given up hope. The next few nights, perhaps even the next whole week's worth, will be warmer than last night, when we got down into the mid-forties.Days will continue to be fine. While the upcoming warmer nights may still be cool enough to stunt or even stop the eggplants' growth, they may also be warm enough to spare the plants, and give me time to devise an experiment in protection. Time for a cloche! I have never built a cloche, nor am I likely to get one of any sophistication built this year. But sophistication isn't what's needed for these little guys. I have a couple of improvisational ideas that I'll be trying, and I'll be using the next few days, with their warmer nights, to get them put together and ready for the inevitable temperature drops these creatures of summer days and nights so abhor. Have any of you built cloches, or improvised them for eggplant — or anything else? I've been long-accustomed to various animals crossing the drive as I go up when headed out, or come down upon my return. Deer, rabbits, wild turkey, a particularly daredevil squirrel and his or her siblings or cousins, the occasional snake, a couple of turtles. I've seen fox a few times. Brownie, my neighbor's cow, made an appearance on the drive during his one and only jailbreak. 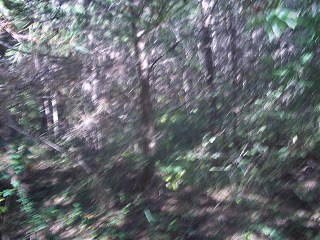 The woods are thick on either side of the drive, and the creatures disappear quickly into the cover offered there. Today, for the first time, it was a bear that crossed my drive as I drove home. The black bear, not fully grown but not a cub either, came out of the woods to the right of me, not far ahead of the car, moving fast. Very fast. I braked and stared hard but the bear was already gone, to my eyes at least, nor did I hear any sounds of his passage into the deeper woods. Even startled and at high speed, the bear moved as gracefully and even elegantly as any wild animal I have ever seen. The bear was gone long before I could grab my camera, but I still got out and took a few steps into those woods -- the same woods I have walked so often without ever seeing any indication of a bear, much less the real thing. But I wasn't dressed for moving through the woods, not quickly anyway, and the bear was. Besides, I'd already startled him — or her — once today, and that was enough. There are spots, many of them, around this little farm, where I can go for a few minutes and recharge myself before returning to whatever task or duty or obligation is at hand. This is one of them, a favorite among favorites, just a little island of quiet in the woods, a spot where the light makes magic and mischief at the same time. until I become aware of the birds, the squirrels, the spiders in their elaborate webs,insects buzzing, a snake seeking someplace.else, more. These woods, and even the most secret spots among them, contain multitudes, and I am honored to be among their number. There is plenty of alone here for all of us. The photo doesn't do it justice, especially with the flash spots, but by the time I realized that, the subject of the photograph had been consumed. Reported to be Europe's most popular market tomato, Carmello doesn't ship well, hence its rarity here. Nor is Carmello one of the lobed whopper/Big Boy/Mortgage Lifter behemoths that many gardeners favor. Rather, this is a smallish, round tomato whose flavor I find rich yet subtler than its larger relatives. There's a fruitiness, an undertone or resonance that I find unique to Carmello, and that I adore. This one was grown from seeds ordered from John Scheeper's Kitchen Kitchen Garden, and this particular Carmello, the most delicious of the season, benefited, I think, from a hot summer, not to mention care and attention from its hot gardener. A delicious, delicate — in terms of shipping, not growth — tomato, deeply loved in the garden and on the tongue. Steady soft rain tapping on tin overhead. A pleasant sound to work by — although every tap reminds me, however fruitlessly, that it's an even better sound to sleep by.